2ml and 4ml Clear or amber vials supplied in packs of 100 complete with screw cap. 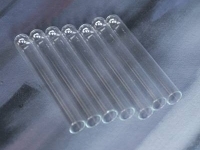 6ml, 10ml, 15ml and 19ml silanised disposable culture tubes supplied in packs of 1000. Tubes are available either plain or with a thread top (caps sold seperately).